Resource center What Is Codeine, and Is It Addictive? 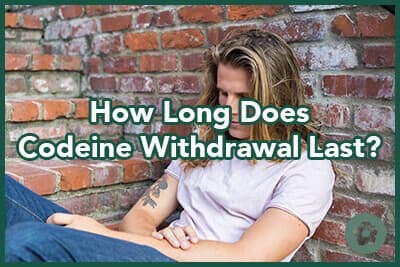 How Long Does Codeine Withdrawal Last? What Are The Signs of Codeine Abuse? Codeine is a powerful opioid drug that the US Food and Drug Administration (FDA) warns can be habit-forming and a target for abuse. As a potent pain reliever and cough suppressant, codeine is often combined with other substances in prescription medication formulations. Due to its highly addictive nature and the potential for abuse, use of codeine should be closely monitored. It is often chosen as a second-line treatment option for individuals who may be opioid-tolerant to other medications. Codeine and opioid drugs are widely abused. Over 12 million American adults misused a prescription painkiller such as codeine in 2015, the NDUH (National Survey on Drug Use and Health) Data Reportpublishes. In 2016, nearly 2 million Americans battled addiction involving prescription pain relievers. Codeine has a half-life of around 2-3 hours, which means that it is generally active in the bloodstream for about six or so hours after taking it. When codeine starts to process out of the body and the effects wear off, dopamine levels can dip. With repeated and regular use of codeine, it can take longer for the brain to return to “normal.” This can result in difficulties regulating brain chemistry without the expected interaction of the opiate. Withdrawal symptoms and drug cravings can then begin. Codeine withdrawal can be intense and uncomfortable, and it is best managed through a medical detox program. The Merck Manual publishes that while opioid withdrawal can be difficult, it is not considered fatal on its own. That being said, a medical detox program that provides 24-hour support, supervision, encouragement, mental health management, and medical monitoring can be highly beneficial during withdrawal. During medical detox, medications can be used to manage some of the more significant withdrawal symptoms and to control drug cravings. A detox program for codeine typically lasts 5-7 days, and is directly followed by a specialty addiction treatment program. The National Library of Medicine (NLM) warns that codeine is a not a medication that an individual should stop taking suddenly without the help of a medical professional. Instead, during a medical detox program, codeine amounts may be slowly lowered through a controlled tapering schedule. The dosage will be lowered in a safe manner over a period of time, allowing the brain to begin to regulate itself on its own. Codeine may also be replaced for a longer-acting opioid drug, such as methadone or buprenorphine, during medical detox; that medication will then be tapered over time. Day 1: Opioid withdrawal typically begins within 12 hours of the last dose. The initial “crash” will generally leave a person feeling lethargic, irritable, and restless. Sleep difficulties are common. Days 2-3: Early withdrawal symptoms include agitation, teary eyes, runny nose, yawning, muscle aches, sweating, rapid heart rate, increased blood pressure, fast breathing, loss of appetite, insomnia, and anxiety. Days 3-5: Withdrawal typically peaks. Added symptoms can include nausea, vomiting, diarrhea, stomach cramps, chills and goosebumps, back and joint pain, dilated pupils, and depression. Days 5-7: Drug cravings may become intense, and physical withdrawal symptoms usually start to lessen in severity. Weeks 1-4: Physical withdrawal symptoms continue to subside. Beyond week 4: The Substance Abuse and Mental Health Services Administration (SAMHSA) reports that difficulties feeling pleasure and emotional “bluntness” as well as depression, anxiety, drug cravings, irritability, and sleep disturbances can continue for several weeks to months. This is known as protracted withdrawal. Codeine and opiate withdrawal is often compared physically to having a really bad case of the flu. 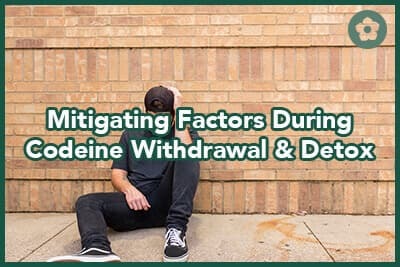 Withdrawal involving codeine is not considered to be life-threatening in and of itself, but the level of drug cravings and physical and emotional discomfort that ensues often indicate that medical detox is the safest and most beneficial method for allowing the drug to process out of the brain and body. Again, pharmacological and supportive care during detox can help to manage withdrawal symptoms and prevent relapse. Minimizing relapse is important as a return to using codeine at previous levels after stopping for any length of time can increase the risk for a possible fatal overdose. A medical detox program can set a person up to be more physically and emotionally stable for admission into an addiction treatment program. Withdrawal may not look exactly the same for every person. There are several things that can influence how significant drug cravings and withdrawal symptoms may be. One of the biggest factors contributing to drug withdrawal intensity is the level of drug dependence that exists. Drug dependence is what occurs with regular use or abuse of a mind-altering substance. The more codeine a person takes with each dose and the longer they take it for, the more significant drug dependence will be. Someone who has been taking very high doses of codeine for months to years, for instance, will likely be extremely dependent on the drug; therefore, dependence on codeine will be very high, making drug withdrawal and the associated side effects more intense. The method by which codeine is used can also impact drug dependence levels. For example, snorting, smoking, or injecting codeine sends it straight across the blood-brain barrier and into the bloodstream faster than ingesting, or swallowing, it does, which can increase the rate of dependence more rapidly. Abuse of other drugs or alcohol can also complicate withdrawal, increasing the potential side effects and level of drug dependence, too. Biological factors like metabolism and genetics can also impact drug dependence and therefore withdrawal. A person with a family history of addiction can have an increased vulnerability to the disease, for example. The presence of a medical condition or mental health disorder can also contribute to the drug withdrawal timeline and the significance of withdrawal symptoms. Someone struggling with depression may notice increased suicidal thoughts and exacerbated emotional distress during codeine withdrawal. Outside factors, including environmental ones, can also play a role in the duration and severity of codeine withdrawal. High levels of stress and low levels of emotional support at home can make drug withdrawal more difficult, for example. This is another reason why a specialized medical detox program can provide the ideal environment for codeine withdrawal. A medical detox program can offer a calming, safe, and secure space to allow the drug to process out of the brain and body, and also provide individuals with tools to minimize relapse and manage withdrawal symptoms to possibly even shorten the intensity and duration of codeine withdrawal. A medical detox program can prepare an individual for addiction treatment and set them up for a healthy recovery.